It is my privilege to serve as pastor to this great congregation. Mickey and I have been married since 1984 and we have three fabulous children – Jonathan who is a youth Pastor in Ohio and is married to Kelsea, Ethan who works for a Pharmaceutical company, and Abbey who is a student atHoughton College majoring in Equine. I wouldn't trade my calling, as a husband, father and pastor, even if I could. 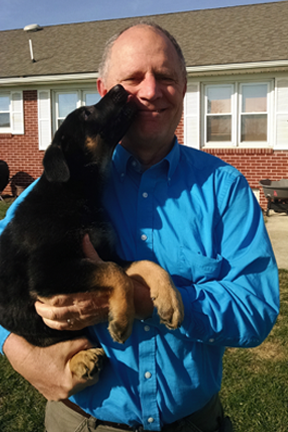 I like training dogs (presently we have two German Shepherds and for years I volunteered with Pilot Dogs, Inc training dogs for the blind), running, coaching, the outdoors, and most of all spending time with my family. I have a collection of degrees from Asbury University (B.A), Asbury Theological Seminary (M. Div), and Ashland Theological Seminary (MA in Counseling and a D. Min. ), but on many days would consider trading them all for a nice walk in the woods. Copyright © Free Grace BIC. All Rights Reserved.